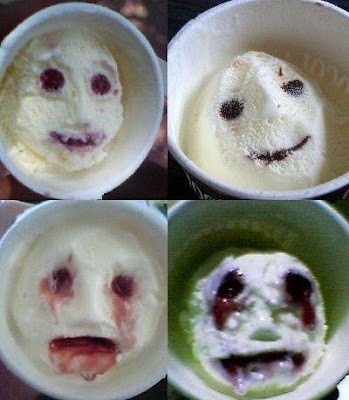 I scream, you scream, we all scream for Panapp ice cream that melts to reveal horrifying faces. Panapp is a popular, affordable ice cream treat made by Glico in Japan. And at first glance, it seems innocuous. It’s vanilla ice cream that comes in a cup, and you can pick from a selection of flavors, from fruits to chocolates. The flavors are injected into the ice cream in four different spots, and sometimes, if you’re lucky, you’ll get a cup with sauce injected in the shape of a cheerful smiley face. It’s adorable! It’s adorable, at least, until you realize that the smiling face is ripe with potential: the potential to turn into something far worse.